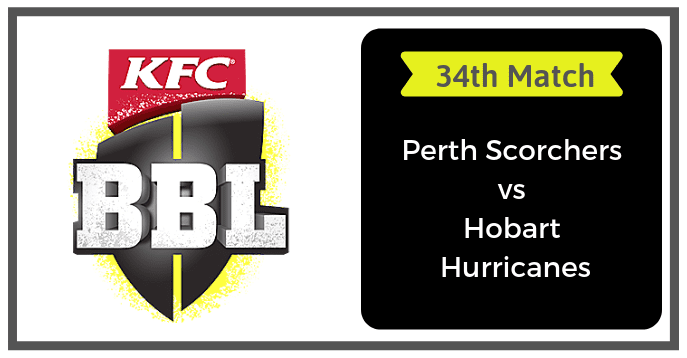 Today Match Prediction of Perth Scorchers vs Hobart Hurricanes, 34th Match Preview, Playing 11, Injury updates, News and Dream11 Prediction. If you are looking for PS vs HBH Dream11 Prediction then you are are the right place. Perth Scorchers is all set to take on the Hobart Hurricanes on Friday, January 18, 2019, at Perth Stadium, Perth. If you want to know who will win then you are in the right place. In Today’s Dream11 Fantasy Cricket Match of PS vs HBH, we will cover Pitch Report of Perth Stadium, Perth, Predicted Playing 11, Toss Prediction, and Fantasy Cricket News and Tips. Who Will Win Today Between PS vs HBH 34th Match? The 34th match of Big Bash League 2018-19 is a clash between two teams who have enjoyed contrasting results and have contrasting points in the table. Perth Scorchers performance was not up to the mark at the start of the season but they have managed to win their last two matches back to back. The form of Cameron Bancroft suddenly gave a boost to their top-order batting. PS has played 8 matches, won 3 and lost 5 matches so far in this BBL. They are at the seventh position of the points table with 6 points in their pocket. The skipper Ashton Turner has contributed the maximum runs for his team and Andrew Tye has taken the maximum wickets for PRS Team. Ashton Turner, Cameron Bancroft and Michael Klinger are the top scorers of Perth Scorchers team. They have scored 300, 195 and 115 runs respectively. Andrew Tye, Nathan Coulter-Nile and Ashton Agar are the top-wicket takers. They have taken 10, 8 and 5 wickets respectively. On the other hand, Hobart Hurricanes are sitting on the top of the points table. They have just lost one game out of 7 and won 6 games. They are in the first position of the points table with 12 points in their pocket. D’Arcy Short has contributed the maximum runs for his team. He has scored in almost all the matches. Riley Meredith has taken the maximum wickets. D’Arcy Short, Matthew Wade and George Bailey are the top scorers of the HBH Team. They have scored 355, 231 and 173 runs respectively. Riley Meredith, James Faulkner and Jofra Archer are the top wicket-takers. They have taken 11, 10 and 9 wickets respectively. Cameron Bancroft, Ashton Turner, Hilton Cartwright, Nathan Coulter-Nile, Andrew Tye, Matthew Kelly and David Willey are the key players of Perth Scorchers Team. Ashton Turner will lead the PS Team. The PRS management has announced 13-players squad. They have made two change in their squad. All-rounder Ashton Agar has been included in the squad in place of Will Bosisto. Nick Hobson has replaced injured Cameron Green in the squad. Cameron Bancroft, Ashton Turner and Hilton Cartwright will lead the batting department. Nathan Coulter-Nile, Matthew Kelly and Andrew Tye will lead the bowling department. The Scorchers will have to make a forced change in their playing 11. Ashton Agar will replace Cameron Green. Batsmen: Cameron Bancroft, Ashton Turner, Hilton Cartwright, Michael Klinger. All-Rounders: David Willey, Ashton Agar. Bowlers: Matthew Kelly, Nathan Coulter-Nile, Andrew Tye, Usman Qadir. Ashton Turner (c), Nathan Coulter-Nile, Ashton Agar, David Willey, Cameron Bancroft, Matt Kelly, Hilton Cartwright, Michael Klinger, Aaron Hardie, Usman Qadir, Sam Whiteman, Nick Hobson, Andrew Tye. Matthew Wade, D Arcy Short, Ben McDermott, George Bailey, Riley Meredith, James Faulkner and Jofra Archer are the key players of Hobart Hurricanes Team. Matthew Wade will lead HBH team. Caleb Jewell has replaced Jake Doran. Jake Doran has joined Cricket Australia XI. Matthew Wade, D Arcy Short and Ben McDermott will lead the batting department. Jofra Archer, James Faulkner and Riley Meredith will lead the bowling department. The Hurricanes will have to make a forced change in their playing 11. Either Caleb Jewell or Alex Doolan can replace Jake Doran. Batsmen: George Bailey, Ben McDermott, D Arcy Short, Caleb Jewell/Alex Doolan. All-Rounders: Simon Milenko, James Faulkner, Johan Botha. Matthew Wade (C), George Bailey, Alex Doolan, Caleb Jewell, Riley Meredith, David Moody, D’Arcy Short, Jofra Archer, Johan Botha, Ben McDermott, James Faulkner, Simon Milenko, Clive Rose. Fantasy Cricket Pro Tips: The above players are most likely to perform today you can take them as a captain and vice-captain. You can also select a captain from playing 11. The last time when Perth Scorchers played against Hobart Hurricanes on this ground, Hobart Hurricanes have defeated Perth Scorchers by 71 runs. If we look at the statistics of the last five matches, PS has won three matches and HH has won two matches. PS has won 5 games out of 6 played on this ground last year and have won two matches out of three this BBL. According to Crix11 astrology prediction, HBH will win the match today. The team winning the toss should opt to bowl first as chasing is a bit easy on this ground. According to crix11 astrology prediction, PS will win the toss and ask HBH to bat first. The match will be played on Friday, January 18, 2019. Match Big Bash League 2018-19, PRS vs HBH, 34th Match. Time 10:30 AM GMT, 04:00 PM IST, 06:30 PM LOCAL. The pitch of Perth Stadium has favoured the bowlers in the first two matches and the wicket favoured the batsmen in the last match. The wicket of Perth generally favours the bowlers but looking at the batting line up of HBH, it could be a high scoring match if they bats first. Overall the wicket will be neutral. The weather of Perth is forecasted to be sunny and it will remain the same throughout the day. The sky will be clear and there is no sign of rain today. A hot and humid day is predicted the temperature is expected to be 27-Degree Celsius and the humidity to be 39%, which may go up to 59%. PS vs HBH Dream11 Tip of the Match: Try to take four top-order batsmen, three all-rounders and three bowlers in your teams. This is it for Today’s PS vs HBH Dream11 Fantasy Cricket Match Prediction of 34th Match. Read the complete post and win in any fantasy cricket league. Leave a comment below and share the post so that others can also find Crix11 which is the best fantasy cricket prediction site. Don’t forget all the information on this website is absolutely free and if you utilize the data correctly your winning chances is 100% sure.